The Oakland business leaders who are pushing the effort to build a new home for the A’s on the city’s waterfront apparently are not the deep-pocketed investors who would finance the plan to build a $500 million facility at Howard Terminal. It’s also clear that the cash-strapped city has no funds to contribute to the project — other than land provided by the Port of Oakland. So who is the real money behind the proposal? According to knowledgeable sources, the owners of the Golden State Warriors are part of one of at least three potential investment groups who are interested in buying the A’s and building the new ballpark in Oakland on their own. The San Francisco Chronicle reported earlier this week that the investor group behind the Howard Terminal ballpark proposal includes former Dreyer’s Ice Cream CEO T. Gary Rogers, Signature Development Group CEO Michael Ghielmetti, Clorox CEO Don Knauss, and former Oakland Planning Commissioner Doug Boxer. Knowledgeable sources tell us that this group is willing to partner with the current Oakland A’s ownership to build a new stadium at Howard Terminal, which is just west of Jack London Square and is not far from downtown Oakland. 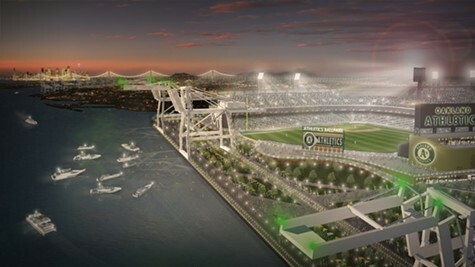 However, A’s co-owner Lew Wolff then told the Oakland Tribune that he has no interest in the Howard Terminal proposal. Yet despite being spurned by Wolff, the Rogers-Ghielmetti-Knauss-Boxer team is not willing to give up on the waterfront plan. In fact, sources tell us the group knew full well that Wolff might reject their proposal. As such, they made contingency plans and have been shopping around the Howard Terminal proposal for potential investors, identifying at least three groups who are interested in buying the A’s and building the Howard Terminal ballpark themselves, sources say. And one of these groups, sources say, is led by Warriors’ owners Joe Lacob and Peter Guber — two wealthy men who had tried to buy the A’s previously. Indeed, Guber, who made his fortune in Hollywood, was part of a 2002 effort to purchase the A’s when they were still owned by Steve Schott and Ken Hofmann. And sources said Lacob, who made his wealth in Silicon Valley, had expressed interest in buying the A’s at the time that Schott and Hofmann sold the team to Wolff and his partner, John Fisher of the Gap retail clothing empire. Lacob declined to comment for this post. Update 10:15 a.m., 12/19: The LA Times is reporting that Warriors' co-owner Peter Guber says he's not interested in buying the A's. Guber declined to comment about whether his business partner Joe Lacob is interested.